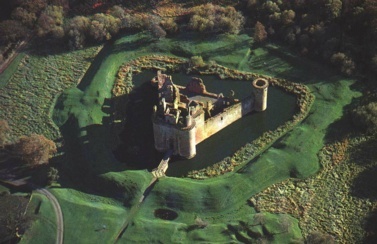 Caerlaverock Castle (from "caer laverock", "lark castle") is perhaps more readily identified with Clan Maxwell than any other historical site. 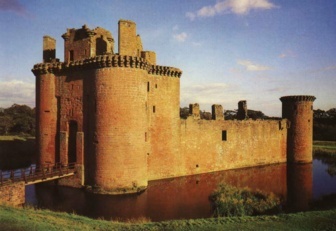 Located just a few miles Southeast of Dumfries, Scotland, Caerlaverock was owned by Maxwells and their descendants from the time when the lands were first acquired by John de Muccuswell early in the 13th century. In the later Middle Ages, it was the Maxwell stronghold when the family served as Wardens of the West March. Over the years it was besieged five times, changed hands time and again, and was at least once almost totally destroyed. Yet today its ruins tell of its fascinating past and epitomize the medieval stronghold. The first castle on the site was built around the 1220s, an earthwork fortification surrounded by a moat in the marshes to the south of the present building. That very basic defensive structure was replaced by a substantial castle, built by Sir Herbert de Maxwell around 1277. It was that structure which was besieged by King Edward I in 1300, the castles most famous event. The old account of the castles construction could just as easily be a description of the present structure. And there are still in the castle some remains of that structure which stood in 1300. But most of the second Caerlaverock was destroyed about 1312, when Sir Eustace Maxwell, having declared for Robert Bruce, king of the Scots, was besieged by Edward IIs forces and, in keeping with Bruces policy of denying the enemy any stronghold which might be useful to him later, demolished Caerlaverock when forced to abandon it. When the castle was rebuilt is not known, but history tells that Herbert of Maxwell delivered hostages at the castle after submitting to Edward III in 1347. In return, Maxwell received letters of protection for himself, his men, and the castle. In 1355 or 1356, Roger Kirkpatrick brought all of Nithsdale under the Scottish Crown once more. 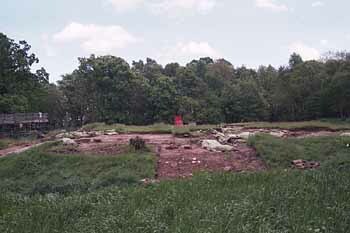 He captured Caerlaverock and, according to a chronicle of the time, reduced it to the ground; however, the same chronicle contains an entry from the following year saying that the same Roger was killed at the castle of Caerlaverock. So it is hard to tell specifically when the structure was again destroyed, but signs of a partial destruction are still evident in todays structure. Evidence suggests that the next rebuilding of the castle started about 1370. Other additions and changes were made through the years, such as the completion of the bartizan of Caerlaverock by Robert, second Lord Maxwell, who succeeded his father Herbert, the first Lord, in 1452 and lived until 1488. While the mid-1400s saw the construction of manor houses by the Lords in England, the relative insecurity of the Scottish countryside led to construction of tower houses by the Scottish Lords. The gatehouse at Caerlaverock served this purpose, with a great chamber on the first floor and rooms on the second floor and in the towers. By the mid-15th century, other buildings rose in the courtyard containing fireplaces and windows. These provided accommodations for guest, while Lord Maxwells rooms were closer to the entrance where, when needed, he could command the castles defense. The 17th century saw even more construction at the castle, with Robert Maxwell, first Earl of Nithsdale, erecting buildings designed for comfort rather than for military fortification. The Nithsdale Apartments, as they are now known, are dated by the inscription of 1634 on a window-head of the Renaissance style buildings which are embellished with much fine detail. This was to be the Maxwells fine house, but it was not to be enjoyed very long. When the truce broke down between King Charles I and the Covenanters in 1640, the king warned the Earl of Nithsdale, who was one of the kings staunch supporters, to look to himself. Accordingly, the Earl gathered 200 soldiers in the castle and withstood a siege for 13 arduous weeks before finally, with the kings permission, capitulating. 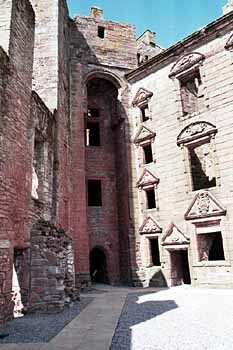 It was following that loss that Caerlaverock was partially destroyed with the intent of rendering it unfit either as a fortress or a residence. The castle has remained a ruin ever since, passing by inheritance through the family of Herries to the dukes of Norfolk. The 16th Duke of Norfolk placed it in the hands of the state in 1946, and it is operated today by Historic Scotland, a government agency which maintains many of Scotlands historic properties. 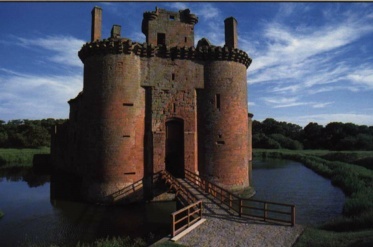 • Click Here ~ For operating hours and directions to Caerlaverock, contact Historic Environment Scotlan.